Innovation – Westphal & Co.
PreFabrication is the process in which we fabricate or assemble electrical construction components – offisite in a controlled environment – prior to their arrival at the jobsite for final installation. PreFab requires extensive pre-planning to determine the optimum alternatives for fabrication in the shop. The process promotes a high level of quality and standardization in the products we install. Westphal & Co. has made an extensive investment in the floor space, tooling, and equipment in order to provide this service to our projects. We have a staff of experienced Electricians, Low Voltage Technicians, Welders, and Mechanics, supported by an engineering staff, that is dedicated to our PreFab activities. We have found that we can move significant manpower from the jobsite to the PreFab Shop. This “pull ahead work” allows us to gain valuable time in the construction schedule, reduces the number of workers on the jobsite, and increases safety for all associated with the project. Increased productivity by PreFabricating the work in a controlled environment, with easy access to tooling and materials, thereby reducing labor costs. Increased productivity at the jobsite, as more units can now be installed per jobsite manhour. Construction schedule acceleration by performing the PreFabrication work parallel with the work being done on the jobsite. Increased safety by reducing the number of construction workers on the jobsite, and by having our PreFab craftspersons work in a controlled environment at grade level. They are not working on higher elevations nor around any heavy construction equipment. PreFabrication necessarily requires extensive pre-planning. The more time spent planning the project on the front end, the more time taken off of the back end of the project. We routinely create full Construction Models our projects in which the Owner and Design Team choose to model the project in 3D. We have a full, in-house staff of BIM modelers, utilizing software products such as Revit, AutoCad MEP, and NavisWorks. This gives us the ability - in collaboration with the architectural, structural, civil, mechanical, and fire protection disciplines – to build the project in virtual space before we build it for real. Using “clash detection” software, the design/construction team can make sure that all of the products fit in the correct places, allowing for a highly accurate plan to build from, cutting significant time out of the construction schedule, and increasing the level of our craftsmanship. Our BIM and CAD technology is used not only at the design and engineering stage, but on the jobsite as well. Our jobsite field staff has received extensive training on the use of BIM and CAD, in order to exploit these technologies to the fullest, and for the benefit of our customers. This not only ensures high quality installations, but also assures fully accurate as-built BIM models and full CAD drawings at project completion. When laying out our work on the jobsite, our crews will use a Trimble Unit/Total Station to locate the work accurately. This device is a surveying tool that uses either line-of-sight laser or GPS technology to measure all three dimensions, which allows us to have precision down to the millimeter when installing embedded materials, locating site lighting, overhead lighting fixtures, and so on. These surveying tools interface with our BIM or CAD technology. This allows us to take points in 3D space out of a BIM model or CAD drawing, transfer them to the surveying device, and then locate them in the real world. 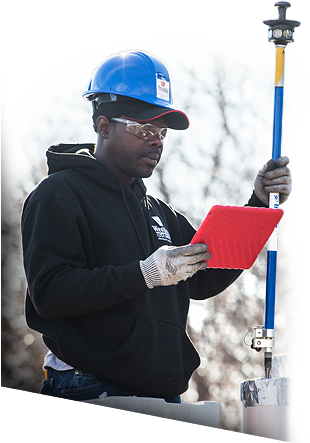 The data flows in the other direction as well, allowing us to survey geographic points on the jobsite and transfer them into the model or drawing for incredibly accurate as-built conditions.